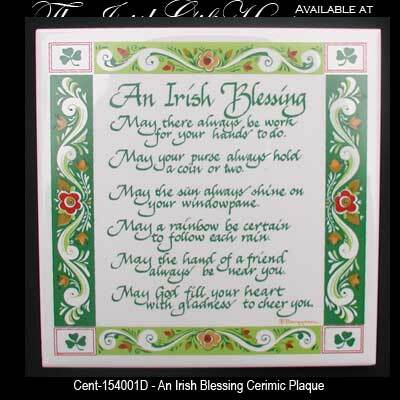 This ceramic Irish blessing plaque may also serve as a trivet or as a decorative tile. Sorry, this Irish kitchen trivet is now sold out and may or may not return. May the hand of a friend always by near you. This Irish blessing plaque is enhanced with shamrocks and is ready to hang on your kitchen wall; it may also be placed on your table to use as a pot trivet or used as a decorative tile. The Irish trivet has a cork backing along with a colorful border and it measures 6" x 6" square. The Irish kitchen blessing is made in the United States and is received with a shamrock history card that is complements of The Irish Gift House.